This gorgeous plate is a tribute to everyone who enjoys spending time on the river. 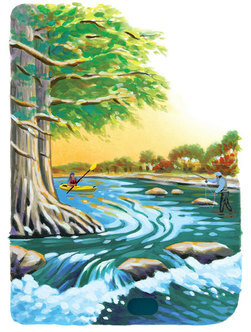 Featuring beautiful flowing water, majestic cypresses and exciting recreational activities, it’s the perfect way to show your love and support of our Texas waterways. 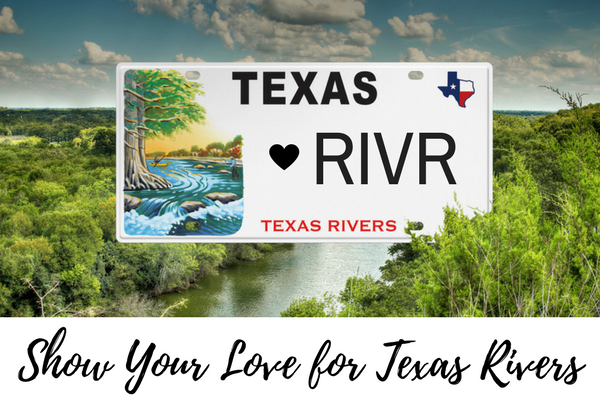 Now you can show your love of rivers and support Texas river conservation efforts by sporting this new plate on your car, truck, motorcycle, trailer or RV. Benefits Texas Rivers: $22 from the sale of each plate goes directly to help conserve Texas rivers through improved access, protection and restoration. No need to wait: You do not have to wait for your vehicle registration renewal notice to order a plate, the cost will be pro-rated. Easy to order: order online or at your local county tax office. Show what drives you and order your plate today—it will be ready in just a few weeks! Or, see www.ConservationPlate.org for more information. *in addition to your regular registration fee.